Polesie is a flat wild region whose inhabitants are mostly birds and animals. The whole region is divided between three countries: Belarus, Ukraine and Poland. Lying west of the Bug River, in the Lublin Voivodship, the Polish part of Polesie is characterised by extensive marshes, swamps and peat bogs, cut through by many rivers and dotted with small lakes. One such belt of land is enclosed in the Poleski National Park in order to protect rare species of waterfowl (lesser spotted eagle, crane, common sandpiper, green sandpiper, grey lag goose, eagle owl, and black stork), mud turtles and many other examples of fauna and flora. Like many peripheral areas around the world, this region has a variety of overlapping cultural influences. This mix of religions and multicultural traditions are remembered during the annual Festival of Three Cultures, organised every September in Wlodawa. 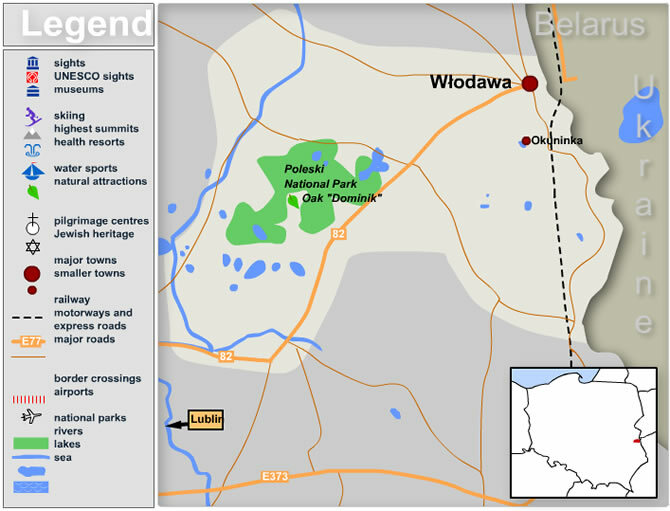 The main town of the area is Wlodawa, and the best way to get to the Polesie region is to travel to Lublin first (easily accessible either by train or by car from Warsaw, Krakow and other big cities). You can continue by bus, especially on one of the many private minibuses. The main bus station is situated close to the centre of Lublin, next to the castle. 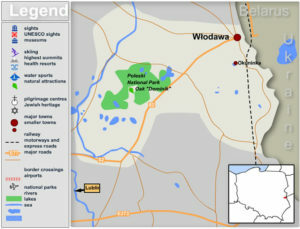 Take a bus to Wlodawa, Leczna, Okuninka, or by car take road no 82 to get straight into the heart of Polesie. If driving from Warsaw, you can also take the E30, and after Siedlce continue along road no 63 through Lukow, Radzyn Podlaski and Parczew.